Last year, I participated in the MARK artist development program run by the New York Foundation for the Arts. 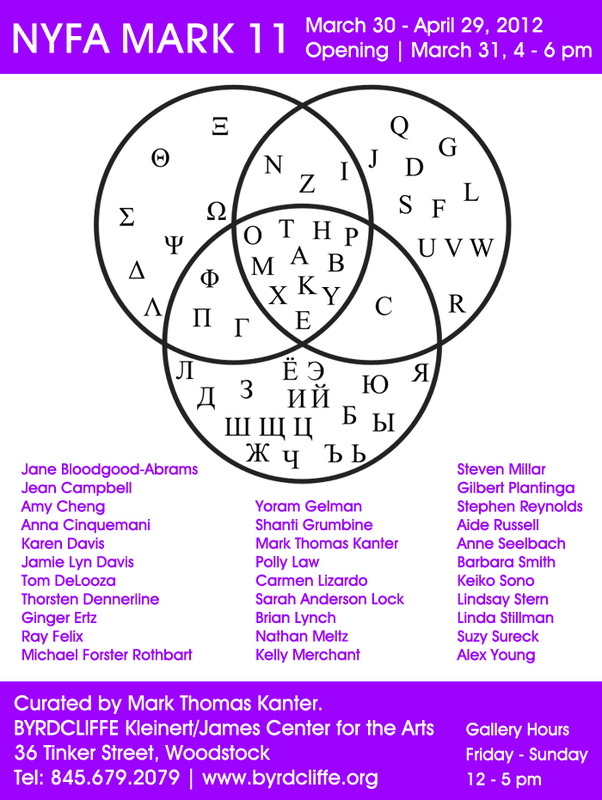 Now we're having an exhibit with all the amazing artists who work in many different fields. The exhibit opens tomorrow, March 31, at 4 pm, at the Kleinert/James Center for the Arts, Woodstock Byrdcliffe Guild, in Woodstock, NY. Show runs through April 29. More details here. 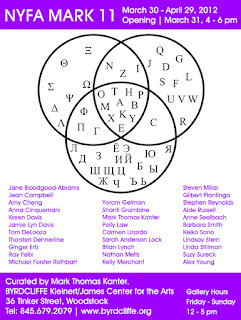 The poster, a Venn diagram showing English, Greek and Russian alphabets, suggests that even when we speak different artistic languages, we can still find commonalities. The curator, Mark Kanter, (plus gallery staff and volunteers) did an amazing job hanging the show so that you discover parallels between the artworks. I was happy to shoot my first assignment for the Boston Globe this month. I spent an evening at the little Nudel restaurant in Lenox, Mass, run by the amazing chef Bjorn Somlo. Second best burrito I've ever had. The story runs in today's paper. At Nudel restaurant in Lenox, MA, customers can watch chef Bjorn Somlo and cook Andrew Trudeau work in the tiny open galley kitchen. Nudel takes its inspiration from the bounty provided by the local farms in the Berkshires. And delicious, I should add. Orion is an excellent magazine, with great photos and fascinating articles. If you're not familiar with it, stop reading my drivel and go check out their website now. So I was flattered that the magazine gave a shout out to my Chernobyl website this week during the Fukushima 1-year anniversary. Thanks! Finally some snow! I escaped my laptop for a few hours this morning to go photograph the fresh snow coating every little branch up at SUNY-Oneonta's College Camp. This particular tree entranced me. I kept coming back to it.